These five ultra-efficient vehicles have earned the Insurance Institute for Highway Safety's Top Safety Pick Award. The Insurance Institute for Highway Safety announced Thursday that the Toyota Prius and Honda Insight had become the latest hybrid vehicles to get the group's Top Safety Pick award. To earn the award, a vehicle has to earn top scores in the Institute's front- and side-crash tests as well as its whiplash protection tests. It also has to be available with electronic stability control, a feature that helps avoid loss of control during sharp turns or sudden maneuvers. 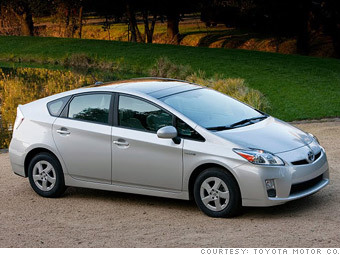 The Prius is most famous, of course, for its chart-topping fuel economy. On the dash, there's an "Eco" button to make it even more efficient and a "Power" button for a slightly wasteful -- but surprisingly fun -- dose of performance.